Tevin Studdard can rattle off all of the names of those who lifted him up when he needed it, set him back on the right path when he was lost and lent an ear when he needed sound advice during his time at Indiana State University. Those people and more will be there to watch the Indianapolis native when he walks across the stage on May 7 and accepts his college diploma - becoming the first person in his family to do so. 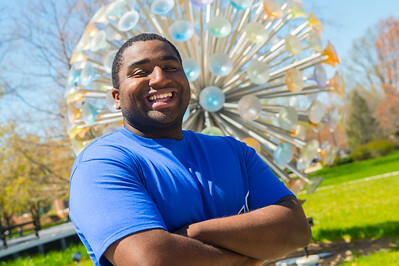 For all the perks Indiana State has offered him as a first-generation student, Studdard's journey to his diploma did not come without its hurdles. After starting his college career at Indiana State in 2010, Studdard took time off during the 2013-14 school year following the murder of his cousin. "My mental state wasn't good for being in school at that time, but once I realized that I could mentally overcome it I enrolled back in college," Studdard said. Through it all, he learned that his big dreams require vision, focus and the discipline to eliminate distractions that had potential to get in the way and he was more determined than ever when he re-enrolled in school. "I feel like once you have a vision and you are focused on that vision, then you're not going to let anything get in your way. If you do let things blur that vision that you have, then you have no one to blame but yourself," Studdard said. "You have to realize that your dreams are bigger and are about more than just you. It is about showing others that they can do it, too, and I work hard to spread that message to others." After graduating with his bachelor's degree in communication, Studdard will venture to Dallas to build upon the business he began constructing in high school - Team Themes. The business, Studdard said, aims to help athletes from middle school to professional to reach their full potential and rally them and their communities to support one another through the use of music. The business has already given Studdard and Mihkail Cooper, who filmed Studdard's music videos, the opportunity to travel to and perform theme songs for 78 college and university teams in 32 states. He sees the business excelling even more thanks to the opportunities he was presented with as a student at Indiana State. "I prefer a smaller learning environment and Indiana State offers the class sizes and settings that allow me to function properly in college," Studdard said. "On top of that, I noticed that the university also has the highest percentage of African Americans, based on the population, in all of Indiana. It was something that got me excited to come here and showed me that (the university) is serious about diversity." Studdard's Indiana State experience has been about making connections on campus through groups like the Collegiate Entrepreneurs Organization and Trendsetters, and working for three summers at Universal Studios in Orlando through Campus Outreach Indianapolis - a network of interdenominational Christian organizations, focusing on evangelizing and discipling college students worldwide. On top of it all, Studdard has also started his own production company, Tevin's Vision. "I produce powerful poems and short films. I'm screenwriting for a movie right now and, in the next year or so, I'll be producing it," he said. "I always wanted to do this, especially because I have a cousin who won American Idol, and it was motivation for me. I've always had these visions in my head to create videos, and now I'm finally at a time and place in my life where I have the resources to make my dreams possible." While he is excited about his graduation and the prospect for a bright future ahead of him, Studdard is equally eager to cheer on his younger sister, Deja, who plans to graduate from Ball State University this summer. "She finished college in three years and she has been an inspiration to me as I've worked my way through college at Indiana State," he said. After graduation and delivering a sermon at his church, Studdard will take his personal drive and the inspiration from his sister as he gets down to business on video shoots Team Themes has scheduled to produce in Atlanta and Chicago this summer. "Mihkail does the filming and editing of all the videos we produce, and I am responsible for developing the concepts and figuring out the locations for all of the shoots that we do," Studdard said. "The partnership has been a perfect match that highlights both of our strengths." Studdard's passion to succeed developed long before he ever stepped foot on Indiana State's campus, but he acknowledges that he was better equipped to tackle the road ahead because of the faculty mentoring offered through Indiana State's African American Cultural Center's Mentoring Assistance for Prospective Scholars program. "That program gave me clarity to see my vision the whole way through," he said. "I learned about making a daily chart to schedule what I'm doing, including when I study, eat and work on my music, and it's helped me be able to keep my focus." There also were people, like the Mentoring Assistance for Prospective Scholars program director, Valerie Hart-Craig, who Studdard credits with helping to jump start his writing when he needed it most. "She was the one who I had a sit down talk with when I entered the program in 2014 and she changed my whole perspective on life," Studdard said. "It was that life-changing experience that really got me to start working on writing music and video scripts." When he was writing and needed to bounce around his ideas for new scripts and lyrics or was looking for help fine-tuning his writing, Studdard knew exactly where and whom he could turn to: the African American Cultural Center and Julia Bruce, the center's administrative assistant. Then there was Lori Henson, a full-time lecture in the department of communication who guided Studdard through the independent study he undertook during his final semester at Indiana State. "My independent study was really about me producing an entrepreneurial plan and learning everything from how to market myself to how to get my product on the TV back home," he said. "Now that I'm ready to turn everything in, I can say that it all turned out great because I was working under (Henson's) leadership. The independent study offered me a more free-range experience than an internship would have and it really showed me what I want to do. I got to take full ownership of my vision and now I know that I can go as far as I push myself in order to create more opportunities." After overcoming obstacles early in his college career, Tevin Studdard of Indianapolis is eager to accept his diploma on May 7 and head to Dallas to build upon the business he began constructing in high school - Team Themes.